The blog challenge for this topic will run for 2 weeks from 23rd August to 6th September. Before we get into the nitty gritty, here is Darcy with the winner for our last challenge which of course was Gels and Mediums, I hope you learned a lot, as I certainly did! I think they are the most exciting products to play with to easily add interest to what you make. Darcy here...What a fabulous theme we have just had! I think you'll agree we all learnt something new. With so many mediums and gels hidden away in cupboards this was the ideal week to dig them out and experiment. Sticking and glueing, stencilling, dripping and embossing with folders! Wow that last one is a great technique. However the one that captured your imagination the most was Lin's Paua Shell technique, that has inspired so many amazing projects. It's Leandra back with you to explore the theme of Circles. I think my obsession with cricles started when the very clever Ellen Vargo made this stamp set for us. EEV06. Since this came out I have used it non stop as I love ALL the spots, and they seem to make any abstract composition better in an instant, especially when stamped in white onto darker backgrounds. So that is a fairly recent obsession as its not a very old stamp set, but it's not ONLY me with the circle obsession! 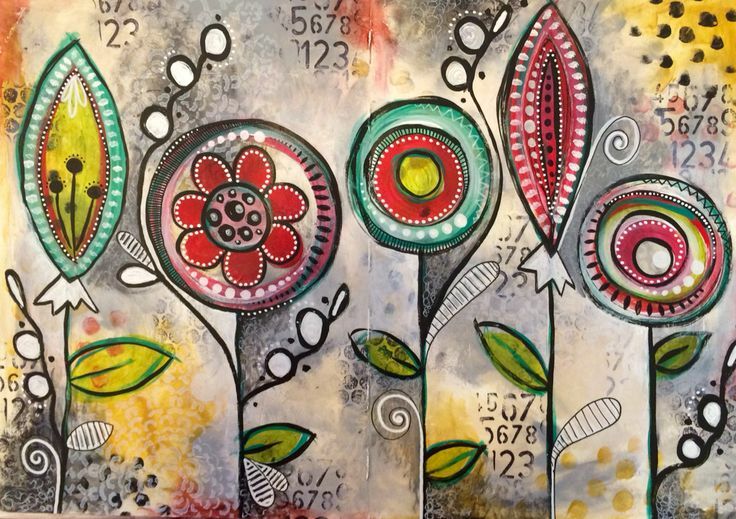 How many circles can you spy on these stamps by Clare Lloyd: ECL04, Darcy: EDY12, Emma Godfrey: EEG07, Lin Brown: ELB19, Sara Naumann: ESN15, and Mark's hot Picks: HP1504. It's pretty clear that all our designers seem to be using circle elements regularly in their stamp sets, and I'm like a pig in mud! 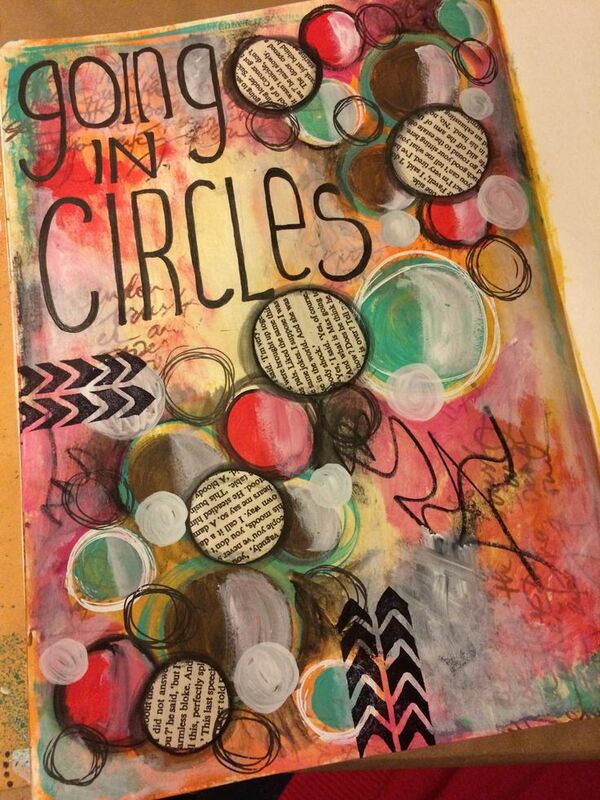 Cannot get enough of the circles, so I knew back in January this was going to be one of our blog topics this year! Sooo excited! For me, this topic screams 'journalling'. I'm going to challenge those of you who haven't given it a go to jump in and make something. It doesn't HAVE to be in a journal, why not on canvas, or card or paper that could be used as an abstract piece to go on display. There is also plenty of inspiration on my Pinterest page . Here's a good starting point if you are looking for a fun idea. This is a painting by Mimi Bondi, but if you go to the site, you can also see there are tutorials, classes etc. I love how this technique evolves depending on the artist doing it. You start with a colourful painted background...for example, you could use my brayer technique (link goes to the video tutorial), or you could just splosh colour about with a credit card. Next step is to draw circles randomly over the BG, big and small. Then you block out the background, you could use black with white as above, or you could use any other opaque colours. 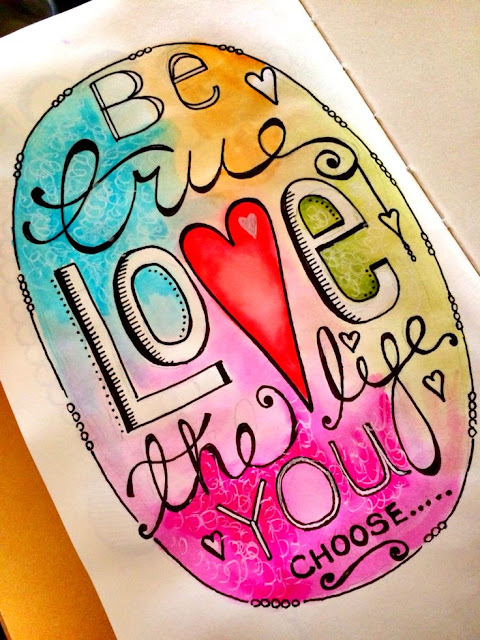 Then you doodle with your paint pens, Posca or Sharpies are pretty popular. It looks Like the example above also uses layers of different BG's to add more interest. 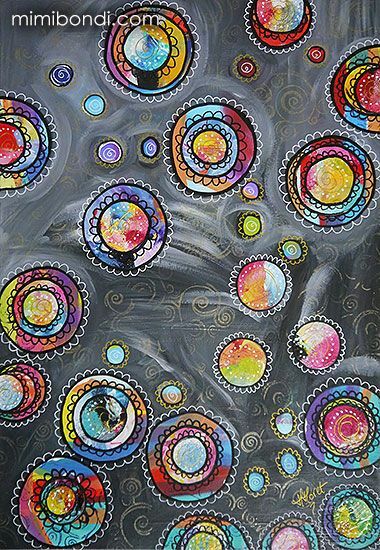 Here's another example from an Abstract Art Site. Here white is used to block the BG, and white and other bocked colours are added in smaller patches on top too. This sort of thing fascinates me. 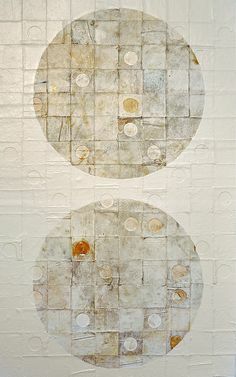 The very structured concentric circles on the canvas have details hidden within. Check out the close up. 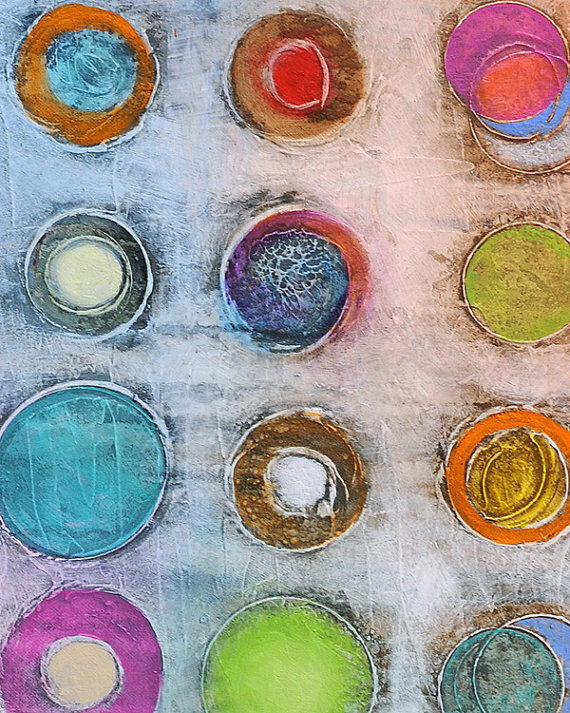 You've just had a lot of inspiration with Gels and Mediums the last 2 weeks on the blog... you can easily see here how they have been used to add texture and interest to the circles, and you can see how there were multiple dark colours under the white areas, and also shadowing has been built up around each circle with colour washes too. Ohhh I'm itching to try this! Tickles of treasure Gold would bring these circles to life too!! Here is another sample by a French scrapbooker, Isa. Again she has also muted the background with whites, leaving traces of pinks and warm yellows present. Splats, drips, spots all brink bolder colours back on to the softer areas to help link the different zones. Gorgeous! 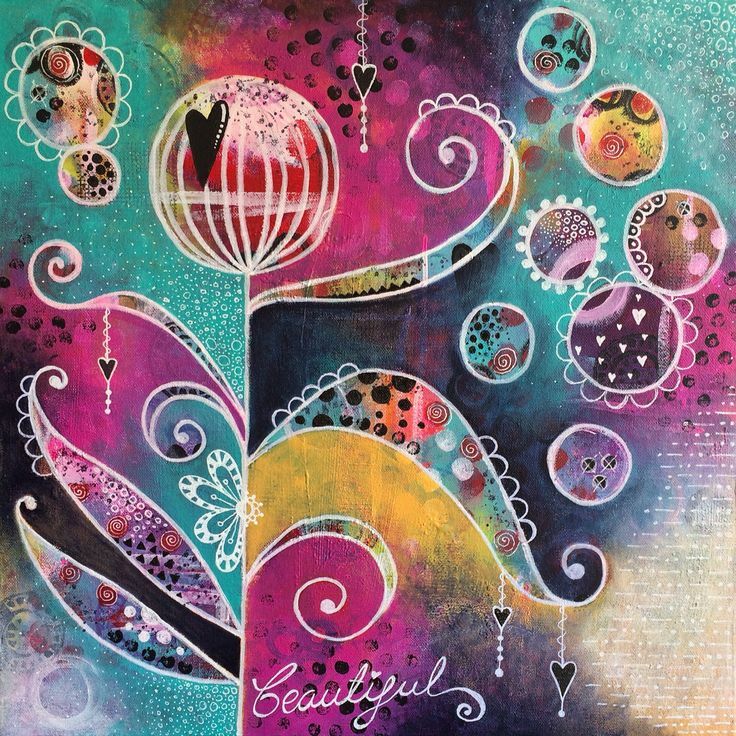 Tracy Scott also does a lot of Journalling using similar 'blocking' ideas in the background, but look how she takes it a step further, by shading, stamping and stencilling her blocked areas to create new contrasts. This adds another level of complexity to the finished piece, and it becomes bold, striking and loaded with contrasts. On this piece I love how the exterior is blocked, and some of the internal letters, but the colours of the background are just softened with white, so that there is still plenty of colour to enjoy. Adore the litttle circles around the edge of the frame! And the black pen details on the lettering. I love how Tracy uses colour, shapes and her easy doodling with pens, both black and white. This example above you can see the entire outline in white paint pen, but also lots of white fine detail doodling when you look much closer too. I love her variation in colour of the blocked shading as much as the focal elements. 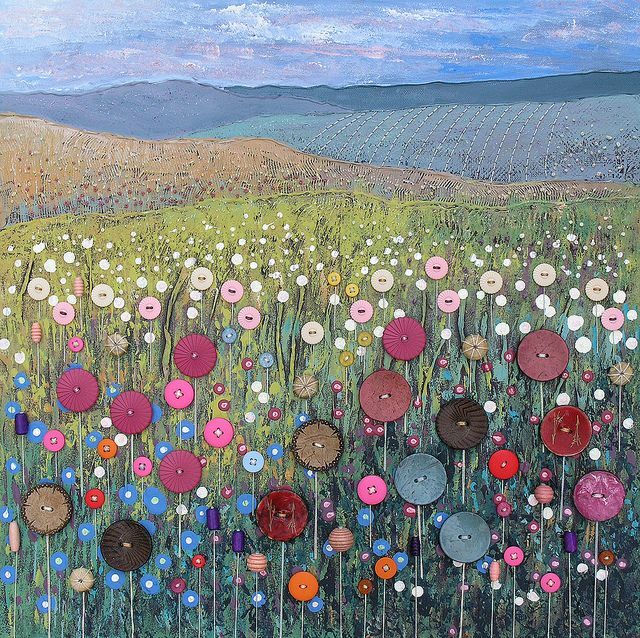 There are loads of examples on Tracy's Mixed Media Pinterest page of her art. She is prolific in her output, and seems to post new things almost daily. Here's a fun video tutorial from Limor Webber, and as the theme is circles, I think it fits our brief perfectly. Again the use of gels is great in this background, and I'm sure you are aware you can use all kind of pigment options to tint your gels, for example have you tried using ink pad reinkers, brushos ? Or, as you know from last week, a heavy body gel can easily be tinted with paint too. On this website, circles are repeatedly explored in minimalist ways. Texture and subtle colour. Stunning simplicity, as seen above. And on this site too. Simple and very effective use of circles. 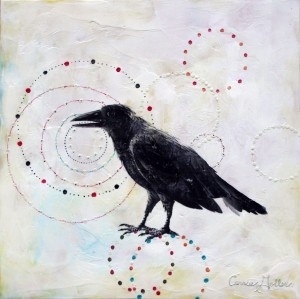 Love the subtle colours and texture in the background contrasting with the crow. 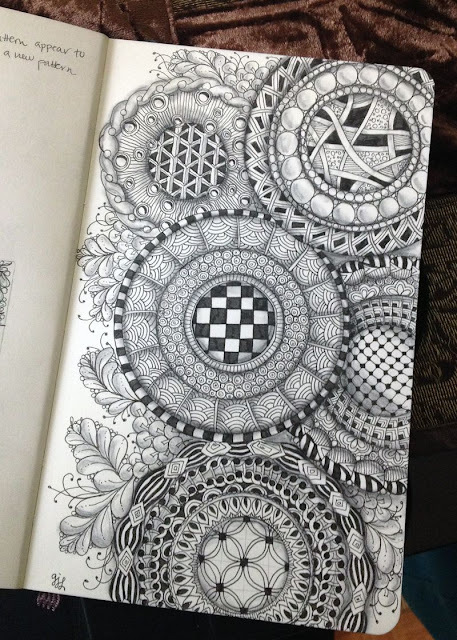 Or maybe in black and white zentangle style? Anyone can draw a circle, and as you've seen from some of this inspiration, they really don't need to be perfect at all! I hope you find something fun to do with some circles, and we look forward to seeing you share what you make on the blog challenge. I'll be pinning more over the next 2 weeks while this topic is open. Do join in if you are able! You are welcome to share your ideas and link up your creativity to this page. All links go in the draw to win a voucher to spend on products of your choice from the PaperArtsy online store. The Circles link will close 17:00 (London Time) Sunday, Sept 6th , winner will be announced 2 hours later at 19:00. Well done Emma!! Another fabulous topic - can't wait to get going on this one too! Congrats Emma! Great into Leandra! Loved the whole mediums and gels challenge, well done to everyone who contributed and joined in! Congrats Emma.Circles is a great follow on from the gels etc.....I hope to use them both together in my entries. 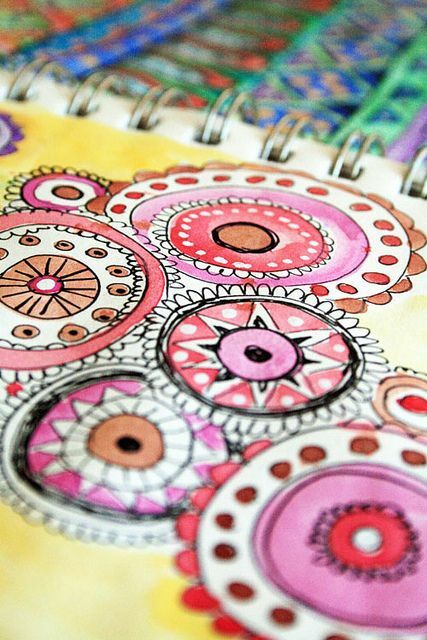 Hmmm art journal pages do come to mind ! 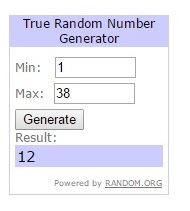 Congratulations Emma, enjoy spending your prize! Now we have another fab topic to get stuck into and love all the abstract examples in the post. What a fun post - love all the circles!!! j.
Congrats to Emma!! The new challenge theme is great. 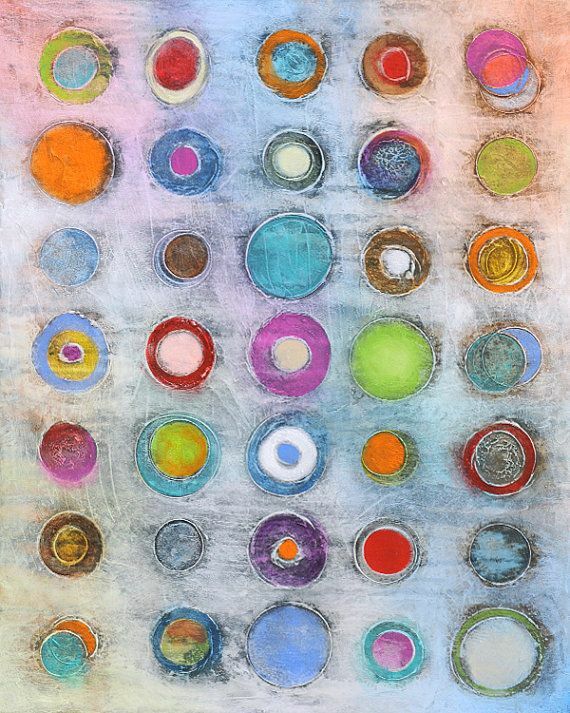 I adore circles...such a great theme, & wonderful inspiration! With new PaperArtsy stamps I just had to join you....wonderful inspiration!